Community Eye Health Journal » Letter. How can we help blind children? Comm Eye Health Vol. 12 No. 31 1999 pp 48. Published online 01 September 1999. Letter. How can we help blind children? I have read with interest your excellent Journal devoted to blind children and their care and rehabilitation (J Comm Eye Health 1998; 11: 33-48). May I make some comments to emphasise some of the points in the article by Dr P Vijayalakshmi about the possibility of treatment for some of these blind children. It is interesting to note that there were significant numbers of children in blind schools in south India for whom some treatment was possible. Sadly, this is even more true in Africa where quite frequently children with treatable conditions are placed in blind schools. The possible treatment is nearly always surgical treatment, either for congenital or early onset cataracts or surgical treatment for corneal scarring and its complications. The treatment for congenital cataract is evolving quite rapidly at present and there is considerable uncertainty as to which is the preferred method of treatment and at what age intraocular lenses should be recommended. However, all these children have many years of potential vision ahead of them. 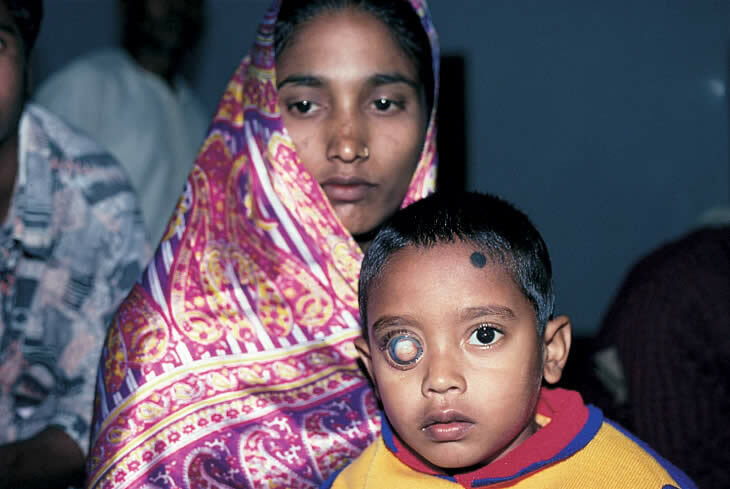 It is well worth taking the time, trouble and expense of referring such children to a unit with good microsurgical facilities and someone experienced in treating congenital cataracts, because the results of such treatment are often significantly better in specialised units. Nystagmus is a very useful clinical sign. Severe nystagmus points to true congenital cataract and a prognosis for vision which cannot be very good. The absence of nystagmus and good fixation, owever, would indicate a post-natal cata-ract and potentially good vision. Children who have been blind for many years, but did have vision in early life, often take a long time to ‘learn to see’ again. This is sometimes a psychologically stressful and difficult time for them to re-adapt to the new sensory input they are receiving. They often need a great deal of sympathy and encouragement to ‘learn to see’ and during this period they may be confused or even depressed. Children with corneal scars may receive real benefit from an optical iridectomy. 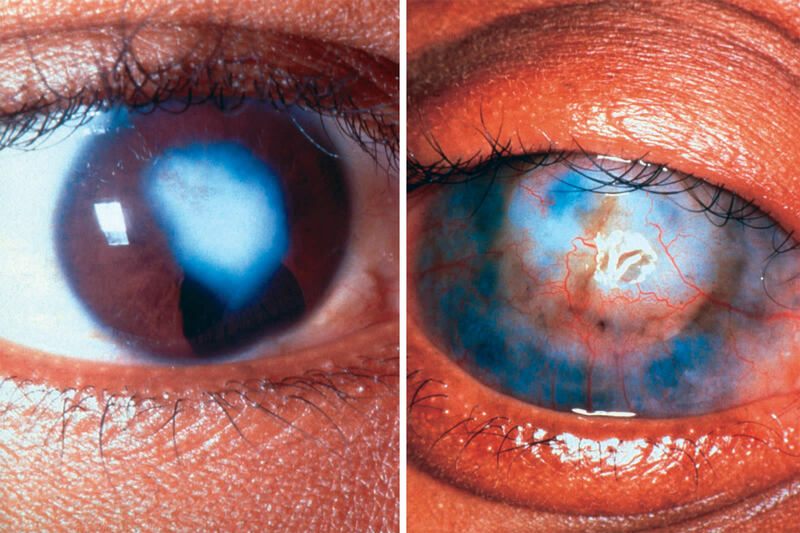 In very severe cases of corneal scarring the iris may be bound down to the lens. There may also be secondary lens opacification, or degenerate or calcific remains of lens matter, which may complicate surgery. Although corneal grafting is very obviously indicated for children with corneal scars, those eyes where scarring is most dense have a high risk of graft rejection. Often an iridectomy operation, which is simpler to perform and requires much less follow up, is more appropriate. Any patient with a corneal scar or who has had an optical iridectomy will be looking eccentrically through the corneao These children may have very severe degrees of astigmatism. A very careful refraction may produce a dramatic improvement in their visual acuity. Finally, there are some children who have blind eyes with staphylomas or buphthalmos where the eye is both painful and unsightly. These children may receive some symptomatic benefit from an evisceration or an enucleation. I hope all these remarks are helpful. Children in blind schools, particularly in developing countries, present a very special challenge to the ophthalmologist, as well as to other carers who are involved in rehabilitation and support.